It’s ski season in Colorado—the perfect time to enjoy a nice hot beverage by a crackling fire. Before spring melts the snow, ease into a steaming cup of comfort with a touch of elevation. Colorado offers some wonderful cannabis-infused beverages in both THC and CBD varieties, including CBD-infused whole coffee beans produced right in Boulder. Coda Signature’s rich Milk Chocolate Marshmallow Spoon is the best-tasting hot THC-infused beverage in Colorado. Stir the chocolate-covered spoon in hot milk, and you have a liquid treat worthy of a cozy night in—and the wooden spoon is reusable, too. Chocolate-on-a-spoon comes in three flavors: Chai (white chocolate infused with spices), Espresso (dark chocolate and coffee), and Chocolate/Marshmallow (milk chocolate with marshmallows). Each mouth-watering variety contains 10mg of THC derived from high-quality CO2 distillate. You can buy a single serving for $5 to $7. As a bonafide coffee snob, I always start my day with a shot of espresso made from freshly ground beans. After just one taste of Sträva’s whole bean CBD Craft Coffee, I added ease to my morning tradition. Not only do Sträva beans taste better than many other whole bean coffees, they’re also infused with CBD to counter the jitters that come from too much caffeine. And they’re produced right here in Colorado. Since Sträva coffee doesn’t contain THC, you won’t find it at a dispensary. Instead, buy it online or look for it in cafes, CBD specialty stores, and homeopathic practices. Sträva comes in several strengths, with a choice of 1.25mg, 2.5mg, or 10mg of CBD per cup. A 12-oz bag costs between $19.95 and $54.95 depending on strength. Sträva also offers a decaffeinated version. Stillwater Beverages combine the highest-quality organic teas and Colombian coffee with a healthy dose of Ripple CBD 20:1. The fast-acting, water-soluble CBD in Stillwater beverages is designed to relax, not intoxicate. Stillwater makes hot beverages in three flavors: Mellow Mint Tea, Gentle Green Tea, and instant Clockwork Coffee. Instant Clockwork coffee is still the easiest infused beverage to bring along when you’re on the go. Stillwater coffee and teas come in packs of 10 costing $24 to $30. Purple Monkey makes high-end, THC-infused teas in three flavors: Strawberry Kiwi, Monkey Mango, and Earl Grey. Each flavor comes in a recreational (10mg per packet) and medical (25mg per packet) dose. Purple Monkey also makes a THC-infused granulated Honey Buzz Sweetener. The Monkey Mango tea I tried was encased in a fancy cloth drawstring bag. After the recommended 7-minute steep in hot water, it produced tea with a rich flavor and a nice mellow buzz. A single packet costs $5 to $7. The Teajuana tea company offers six varieties of hot beverages, each infused with 10mg of CO2-derived THC oil: Earl Grey Tea (sativa), Pomegranate Tea (hybrid), Hibiscus Rooibos Tea (indica), Continental Blend Coffee (sativa), Hot Apple Cider (hybrid), and Traditional Hot Chocolate (indica). With the exception of the hot chocolate, each variety is available in both a tea-bag-style pouch and a pod that’s compatible with Keurig coffee makers. I tried a bag of the Continental Blend Coffee. Teajuana’s recommended steep time (90 seconds) produced a weak coffee with a very light effect. For a stronger effect, steep the bags for 7 minutes. Better yet, use the pods. A single serving of Teajuana costs around $6 to $8. This month, Willie Nelson’s wife Annie released her version of CBD coffee beans. The beans are infused with certified organic, full-spectrum hemp oil grown in Colorado. The coffee is sourced from smallholder farms in Colombia. When properly brewed, each 8oz cup of coffee contains 5mg of hemp-derived CBD. An 8oz bag is available online for $36. It’s almost Valentine’s Day, and love is in the air. Whether you’re looking for a gift for your main squeeze or treasured friend, you can’t go wrong with these cannabis-infused Colorado selections. If you’re looking for the perfect gift for your cannabis-lovin’ Valentine and you live near Boulder, you’re in luck. 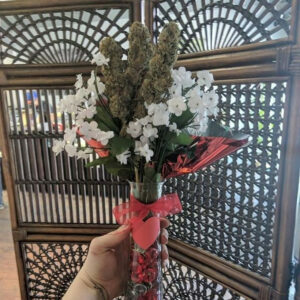 This year, Boulder Wellness Center is offering long-stemmed cannabis flower bouquets for Valentine’s Day. Each strain-specific bouquet contains 7—28 grams of highly potent apical colas, cut from the tops of Boulder Wellness Center’s house-grown plants. Add a few long-stemmed roses from a local flower shop and your gift will always be remembered. Note: You can buy a bouquet of long-stemmed cannabis flowers at “signature” pricing, but act soon, February 11th is the last day to pre-order. You won’t find this offer on Boulder Wellness Center’s menu—you need to go to the storefront to sign up. KushKards are greeting cards made especially for cannabis enthusiasts. Each KushKard has a reusable match striker and a place to insert a pre-roll of your choice. Whether you make your own pre-rolls or pick some up, KushKards are the perfect way to deliver the gift of cannabis to all your friends this Valentine’s Day! 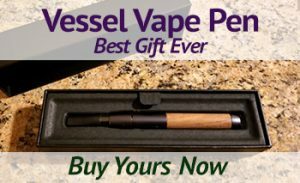 You can buy a set of 5 assorted Valentine’s KushKards for $20, or upgrade to a set of 5 One Hitter Kards (with a one-hitter included) for $40. When I toured the Coda Signature chocolate factory, the facts confirmed what my taste buds already knew—Coda Signature makes the highest-quality, best-tasting chocolates in Colorado, cannabis-infused or not. Their truffle collections, handmade with fresh, curated ingredients, are a top-notch gift for your loved one. I recommend The Forte Collection, with hazelnut, passion, and tiramisu truffles. You can purchase a 6-piece box for $18 to $25. High Love is an aphrodisiac that will make your bed levitate … At least that’s what the manufacturer claims. I don’t know about the levitation part, but with five plant medicines that boost sensuality, High Love is bound to take your Valentine’s day a little higher. Ingredients include 5mg each of CBD and Blue Dream-derived THC, Damiana to curb inhibition, Catuaba to increase sexual desire, theobromine for energy, Ashwagandha to reduce stress and boost libido, and Muira Puama, known as the “Viagra of the Amazon.” (You can guess what that does.) You can buy a box of 6 chocolates for $24 to $26. If you’re looking for the perfect sensual gift for that special lady in your life, consider Foria Pleasure. This 100% organic arousal lube is formulated especially for women to heighten pleasure and diminish discomfort. Clients report enhanced access to and deeper orgasms. Pleasure contains 3mg of THC per 8 single droplets. Based on customer feedback, Foria recommends using 5 to 15mg at a time. Depending on the size, a bottle of Foria Pleasure will set you back around $20 to $75. If you read my article about CannaMojo last summer, you already know what it does. The 10mg of THC in Cannamojo gives men increased desire, increased sensitivity, and more intense orgasms. The blend of sexually enhancing herbs will keep him going all night. A dose only costs around $10. I can’t think of anything better than spending a CannaMojo-enhanced Valentine’s Day with your lover. That is, unless you add Foria Pleasure and High Love chocolates to the mix! Just 14 miles from New Mexico, 113 miles from Texas, and 116 miles from Oklahoma, Trinidad is a major canna-tourism destination. That’s how Trinidad, Colorado can support 30 dispensaries—even though their population is only about 8,000 residents. Unlike many other towns, Trinidad allows dispensaries to set up shop right next to each other. Because of this, more than half of Trinidad’s dispensaries are clustered in a small part of historic downtown known as “The Strip.” This close environment has created some of the most competitive pricing in Colorado. Bonus: Trinidad dispensaries love veterans—dispensaries offer some of the best veteran discounts in the state. With so many choices, it’s hard to figure out which dispensaries in Trinidad make an ideal pit-stop. Check out our picks and get ready for some serious deals. The first dispensary to open on The Strip, Faragosi Farms serves as a model and inspiration. Though I had arrived at Faragosi Farms just ten minutes before close, my budtender, Jess, took her time and answered all my questions without a rush. And she really knew her stuff (she even writes the cannabis column in the Trinidad New Legends magazine). I asked Jess how Faragosi Farms has a 4.9-star rating on Leafly with more than 300 reviews. She said that in addition to a large selection of quality products and excellent customer service, Faragosi Farms is dedicated to giving back to the community. This family-owned business donates 30% of their profits to charity. Rooted offers a wide variety of strains as well as inexpensive shake and cartridges. Their flower comes from their natural soil grow or from the well-known craft cultivator, 14er Boulder. Rooted has low prices on edibles every day, with even bigger discounts on bulk purchases. Magnolia Road Cannabis Company sells a wide variety of indoor and outdoor flower. Their goal is to provide customers with the best flower deals in Trinidad. When I visited, they had ounces priced as low as $45. I was impressed with Magnolia Road’s honesty about why their buds are discounted. Some stores offering inexpensive ounces try to pass them off as premium buds. At Magnolia Road, they explain exactly why the cannabis is discounted and help customers decide which grade is right for them. Rocky Mountain Cannabis has scored a perfect “5 stars” on Leafly in less than a month of operation. I asked owner Jorge Ferrin why. “I focus on providing a wide variety of the highest quality strains from reputable growers,” he explained. The dispensary carries more than 40 strains from top-shelf growers like Verde Natural and Silverpeak Apothecary. Jorge’s goal is to provide a laid-back shop for local Trinidad residents. “I encourage my budtenders to take their time, have a good attitude, and never upsell,” he said. Located a half mile from The Strip, Rocky Mountain offers significant discounts to veterans and local residents. Many of us have aging parents or grandparents who would truly benefit from cannabis medicine. Lately, cannabis has become so mainstream that previously opposed seniors are even seeking it out! The holidays are a perfect time to help them with an infused gift. We’ve put together a gift guide for the enlightened senior citizen in your life. These products are also perfect gifts for anyone who is new to cannabis. Sweet Grass Kitchen’s Mojito Mint Buttermelts are bite-sized candies infused with full-flower cannabutter. Each Buttermelt contains 2.5mg THC—a perfect dose to use while figuring out your comfort zone. The instructions on the package are newbie-friendly, comparing one piece of candy to one alcoholic drink. A container of 40 mints retails for around $25. Caffeine-free Mellow Mint tea is designed for relaxation. Lightly-caffeinated Gentle Green tea helps boost energy and control anxiety. Clockwork instant coffee has a full dose of caffeine for energy, combined with CBD to kill the jitters. The beverages come packaged in a classy tin canister that’s perfect for gifting. Each canister contains ten coffee or tea sticks and retails for around $25. A quick survey of budtenders revealed that Mary Jane’s Medicinals’ Cannabis-Infused Salve is the go-to product for the older crowd when they have aching joints, sore muscles, and other painful ailments. It contains essential oils like lavender, peppermint, and orange. The silky-smooth texture absorbs easily into the skin. The salve is available in 4 oz ($45), 2 oz ($30), and 0 .5 oz ($10) sizes. The THC:CBD ratio is 3:1, with the 4-oz version containing 270mg THC and 90mg CBD. These oils are excellent for the senior crowd. They’re sugar-free, gluten-free, discreet, and very easy to use. Just sprinkle the contents of a dropper over your meal to add 3.3mg of CO2-derived THC. My friend’s grandmother carries a bottle wherever she goes. The intricate packaging art and high-end ingredients in Binske’s single-origin, organic, extra-virgin olive oil, makes it a lovely gift. Each 30ml bottle costs $25 to $30 and contains 100mg of THC. The oil comes in four flavors: Fire (infused with chipotle peppers), Earth (infused with garlic), Water (infused with Lemon), and Wind (straight-up olive oil). LucidMood takes their slogan “Mild & Dialed” seriously. Their products are designed to help consumers change moods without clouding their minds. To this end, all their pens have a 1:1 THC:CBD ratio. The CO2-extracted cannabinoids are combined with botanically sourced terpenes. This combination is thought to produce targeted effects. LucidMood’s Wellness line includes pens for Calm, Relief, Sleep, Focus, and Lift. Their Lifestyle line includes pens for Energy, Chill, Party, Bliss, and Relax. Each 200mg pen contains around 40% THC, 40% CBD, and 20% terpenes. And the best part? LucidMood pens have no PG, PEG, or other additives. You can pick one up for around $30. Colorful fall leaves are showing in Colorado early this year. So the time to get out and go is now, and (unsurprisingly) the place to be is the gorgeous Rocky Mountains. Jump into the season with cannabis. Check dispensaries near you. Watching the changing of the leaves is even better when the experience is enhanced with cannabis. So I took a trip through the heart of aspen territory with Jon Kell—a professional guide—to peep the colors. But before you head to the Rockies, check out these mountain dispensaries on your way up. Silverpeak Apothecary is more than just a dispensary—it’s an experience. Called “the Tiffany’s of weed” by regulars, Silverpeak features stunning displays, informative budtenders, and high-quality buds. They even have clean bathrooms and a snack bar onsite (The 520 Grill). “It’s all about providing a great experience,” said our budtender, Ryan, who also told us where the local leaves were popping. Silverpeak cannabis grows just down the road in Basalt, Colorado. And by recommendation, we were offered the cerebral strain Dragon, perfect for taking in vivid colors and fresh air. Insider tip: With informative budtenders, lots of medicinal products, and a selection of cannabis pharmacology books, Silverpeak is a great destination for newbies. At the edge of Breckenridge sits a strip mall of weed that’s affectionately known as “the green mile.” Although tourists go to all the dispensaries, Organix is the local smoker’s pot shop of choice. Andrew recommended Blue Dream for peeping changing leaves, and it truly made the aspens look dreamy. Insider tip: If you want to buy cannabis in Breckenridge during the busy season, budget in some extra time—despite the plethora of shops in the area, there’s typically a wait just to get in the door. High Q in Carbondale sells high-quality flower grown in live soil with organic pesticides. Their Bruce Banner pre-roll, recommended by budtender Lark, really hit my leaf-peeping spot. But my favorite find at High Q was the Eyce Sidecar. At only $70, this silicone rig makes dabbing easy, even if you’re going off-road. Insider tip: Check out Slow Groovin’ BBQ in Marble, Colorado for a delicious after-trek meal. Backcountry Cannabis Company in Crested Butte (formerly the Breckenridge Cannabis Club) has almost a decade of cultivation and extraction experience in the High Rockies. BCC cannabis is grown in Oak Creek, using indoor soil-based organic practices. As the retail outlet for Kayak Cannabis, BCC has great prices on Kayak concentrates, Kayak caviars, and Cheeba Chews (made exclusively with Kayak concentrates). Behind the counter, Tom suggested a Chemdawg Kayak Caviar Joint for the mountains. A combination of Chemdawg bud, oil, and kief, this pre-roll made for a potent autumnal experience. Insider tip: If you’re hungry in Crested Butte, check out The Last Steep—their Bloody Mary bar and jerk chicken are positively mouthwatering. The Green Joint is so proud of their cannabis farm in Rifle, Colorado that their reception area features photos and a video of their grow. Chelsea recommended Clementine, a high-energy strain with no raciness. I bought their 4-joint special for $25 and wasn’t disappointed. The Green Joint also has dispensaries in Rifle, Aspen, and Parachute. Insider tip: For a less touristy experience, Chelsea also recommended Iron Mountain Hot Springs over the more crowded Glenwood Springs. High Country Healing cares about educating their customers—they are the only dispensary I know of that has a vegan, gluten-free, and sugar-free menu. High Country Healing divides theirs bud into five distinct varieties based on effect. Christian offered Gold Label (euphoric, creative, focused) before a colorful hike, and Purple Label (zen, relaxing, peaceful) for relaxing afterwards. I also decided to buy some delicious and unique Jade & Jane’s cupcakes which were the perfect edible at 10,000 feet. Insider tip: If you show the budtender your medical card, High Country Healing with give you a 30% discount.